You guys. I’ve been holding out on you. I’ve been thinking about posting this recipes for – no joke – four years now. But I couldn’t get a pretty enough picture. I’ve tried. I’ve made it at all times of day, using all colors of plates. No dice. I came to a gut-wrenching realization. This dish is just not that pretty. I agonized. Should I post it? Should I make it just one more time, try one more plating? But in the end, I just couldn’t do that to you. I couldn’t deny you the joys of this recipe any longer. Because, you see, it’s a recipe that kind of sums up everything my cooking is about. It’s EASY. It’s elegant. It’s something you could serve your kids for dinner on a Tuesday night or your in laws the first time you meet them. I got the recipe from my mom. The recipe features cheese. The ingredients are relatively easy to find. I have a huge rosemary plant in my garden. All these reasons are why this dish, this unpretty but incredibly delicious flank steak with cheese, should become part of your rotation. And so, prettiness aside, I am sharing it with you. 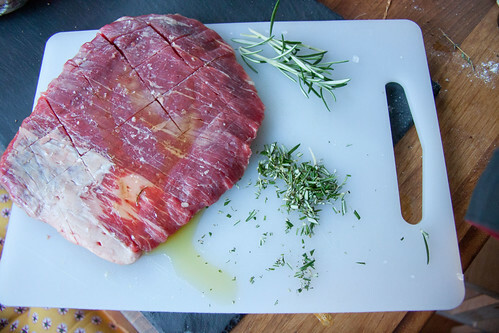 Flank steak used to be a cheap cut of steak. Sadly, others have become hip to its great flavor, and nice texture (it has some chew to it, but it’s great sliced thin. Against the grain), so the price has gone up. I buy it every time I find it on sale and throw some feta and parsley into my cart as well so I can make this. Have I mentioned it’s crazy easy? And my kids love it? And my husband loves it? (Which kind of doesn’t count. My husband, bless his heart, is a goat and eats pretty much everything enthusiastically. But still, he likes this). I like to pair it with a (say it with me) green salad – Caesar is especially nice if everyone you plan to kiss eats the same thing and you’d like to repel vampires and/or mosquitos (both recipes do feature garlic). It can stretch even further if you add in some polenta, or some risotto or pilaf. It’s pretty versatile. It also feels like barbecue without actually being grilled, and although you use your oven, it’s for such a short period of time, it doesn’ t heat up your kitchen. What’s not to love? Sorry this recipe hasn’t been in your life sooner. I will try not to let perfect be the enemy of good. Score the flank steak in a diamond pattern, rub salt and pepper and 2 Tablespoons of rosemary into steak, and drizzle with olive oil. Place on a baking sheet lined with foil. Preheat broiler to high. Position the rack about 5 inches from the heating element. Broil the steak for 4 minutes. Flip over and broil for 3 minutes. 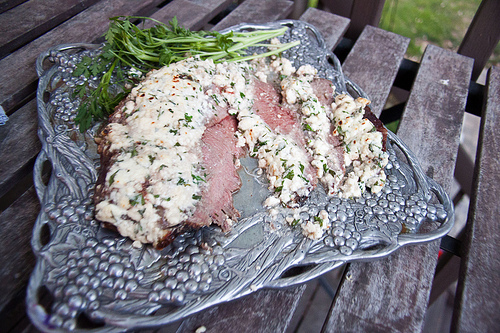 While the steak is broiling, mash the feta, garlic, remaining rosemary and parsley together. Add milk to thin the mixture until it is spreadable. Spread the cheese mixture over the steak. Broil an additional 2 minutes, until cheese is starting to brown. Slice thinly (AGAINST THE GRAIN) and serve. You can substitute dried rosemary for the fresh in this recipe. Use teaspoons instead of tablespoons. Slicing against the grain: If you look closely at a flank steak, you will see muscle fibers running in a line along the meat. Slice it to cut these muscle fibers into tiny pieces, rather than slicing with the fibers.